I’ve written at some length about my admiration for the work of Dominic Lash, and I’ve been consistently excited by what I’ve already heard from Josh Sinton (primarily Holus-Bolus and Ideal Bread, plus his contributions to Nate Wooley’s quintet and sextet and Darcy James Argue’s Secret Society). 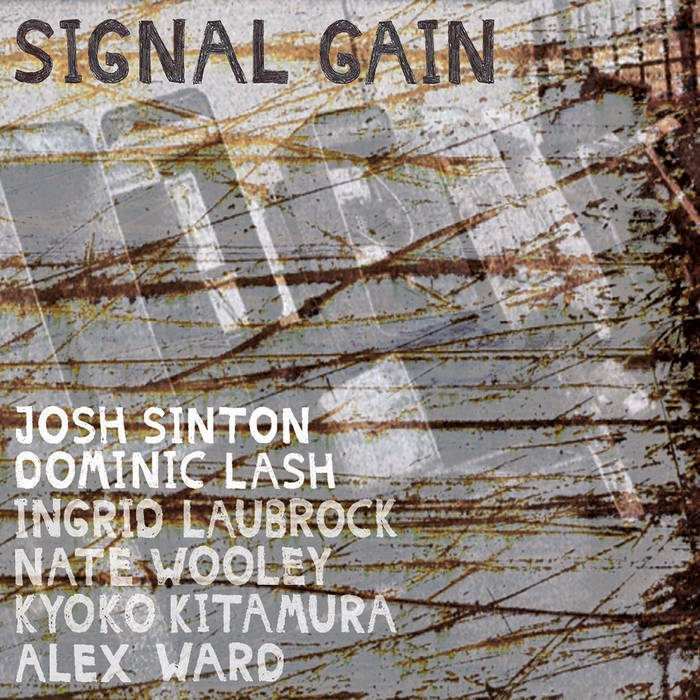 On both his website and Twitter, Sinton’s written at length about improvisation, and I was really excited by the lineup he and Lash brought together for this recording. As several contributors to this blog have mentioned, Ingrid Laubrock has emerged as one of the most remarkable players on the scene. Nate Wooley is well-known as a highly skilled and experimental improviser. Kyoko Kitamura has one of the most wonderful, expressive voices in creative music. And Alex Ward is a prolific and phenomenal clarinetist (and sometime guitarist, though not here), who has previously recorded with Lash. 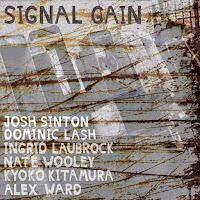 On Signal Gain, Lash and Sinton lead the sextet through a series of improvisations, rotating through a variety of pairings, from quintet to duo. There’s something of a mathematical interlocking when viewed through the lens of the credits, which have a legend to decode instrumentation, as well as shorthand of each participant’s last name. I’d recommend, however, that any listener skip right over that and just dive right in to this extensive sound world. First, the album is organized into a set of subgroups. There are the three duets with Lash and Sinton: “Las-Sin(ax)” with Sinton on baritone saxophone, “Las-Sin” with Sinton on amplified contrabass clarinet, and “Las-Sin(cl)” with Sinton on bass clarinet. These duets are lively and provide some connective tissue between the larger group improvisations. They also tease (hopefully) more duet recordings from Lash and Sinton. The pair complement each other nicely. Next are the large-groups, quintet and quartet. On album opener “Las-Lau(t)-Sin-War-Woo,” each player enters and exits in quick bursts, for the first several minutes. There’s an effect of lights being switched on and off, or streaks of sound teasing their way through the air. The tone is set for a comfortably open improvisation, with the participants listening keenly and reacting to each other with something barely resembling call and response. Halfway through the opener, Sinton goes to the lower register for some deep, earthy tones. Laubrock plays a lyrical line, taking up the middle range, and Ward layers a few brisk runs in the upper register. Gradually, Lash and Wooley make their way back to the group, with Lash picking up the pace for a rapid chase to the finish. Interestingly, Kitamura appears on only one track, “Kit-Las-Sin-War,”and I felt like there was a missed opportunity not pairing her with Wooley. Both have an impressive, almost supernatural range. Though, to be fair, Kitamura and Ward, paired with Lash and Sinton, makes for a fascinating doubling, with Kitamura and Ward in the upper register, and Lash and Sinton in the lower one. Much like the three duets, one could make a grouping of “Las-Lau(s)-Sin,” “Las-Sin-Woo,” and “Las-Lau(s)-Sin-Woo,” largely because they depend on the strong connection between Lash, Sinton, Laubrock, and Wooley. “Las-Lau(s)-Sin,” with Laubrock on soprano and Sinton on amplified contrabass clarinet, is one of the highlights. “Las-Sin-Woo” explores the quieter sides of all three instruments, bass, contrabass clarinet, and trumpet. It’s reminiscent of some extended improvisations Wooley’s done in the past, a very subdued, brief sonic exploration. And “Las-Lau(s)-Sin-Woo,” the album closer, is an unqualified success. Though it isn’t the longest track on the album, it’s got a languid tone that eases towards its conclusion. OutNow has been releasing some great small and larger group improv records for a while now. I’d like to see more with Sinton and Lash, specifically, whether that’s a long duet or another of these rotating collective albums. The two have a strong connection, and I’d like to see additional meetings build on the ideas here.